The snow has people around Southeast Wisconsin excited. Both kids and adults are getting outside to enjoy it. The falling snow means dollars for Jude Kearney, 17, who runs a plowing business after school. “It’s finally nice to head out tonight and get some work,” said Kearney. The Oconomowoc high school student is getting gas for his snow blowers. He hasn’t had any plow work since New Year’s Eve. “A lot of my fellow high school students and friends help me out and work for me. And we have a great time,” said Kearney. 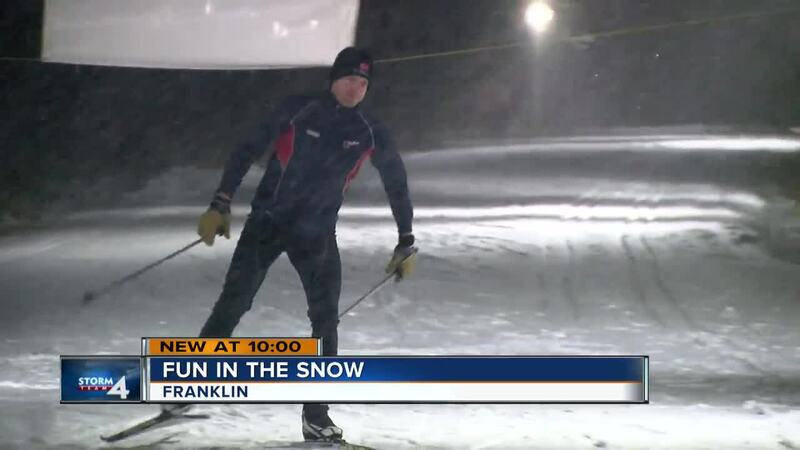 The snow is also bringing excitement to some cross country skiers in Delafield. “We’ve been waiting all winter for some nice wintry wether,” said cross country skier Nick Reistad. That includes Charles Corvitt who came all the way from Alabama for the chance to enjoy some snow. “I come up here once a year for a long weekend to cross country ski,” said Corvitt. Now the skiers are just hoping the snow continues to fall so some of the back-country trails can finally open this season.